Cut the tube into two sections - 4-inches and 7-inches. Set the 4-inch piece aside for another craft project. 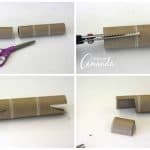 Use the pinking shears to cut 1.5 (one and a half) inches into one end of the tube. Repeat this same cut on the other side. Then cut two more slits from the end of the tube at 45-degree angle, joining them with the ends of the first two slits. This creates the open mouth. Using regular scissors at the opposite end of the tube, cut out the tail using the photo guide above. Take the tail piece that you just cut from the tube and flatten it. Cut that piece into four equal pieces for the alligator's feet. Cut toes from the foot pieces. Shape the mouth with the pinking shears. Cut so that both sides are angled and trim the front edges so they look like teeth. Paint the entire tube with green paint. When everything is dry, paint the teeth white. Add a glue dot to the flat end of each foot. Attach the legs to the alligator's body. Add googly eyes and use a fine point marker to add nostrils. 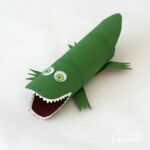 This project for Cardboard Tube Alligator was printed from CraftsbyAmanda.com - https://craftsbyamanda.com/cardboard-tube-alligator/ and can only be printed for education or personal use.